We are a publishing company ready to serve the needs of all authors, new or old without the hassle; and you’ll be pleased to know that query letters or literary agents are not a prerequisite. We are happy to look at your manuscript and we can help you get your book in print. Necessity dictates that we not be in a hurry to get this site completed because we have more than enough production to keep this fledgling business going until it is ready for full fight. Getting it right is more important to us because we are building our foundation; so we are going to take it slow and easy. Our latest publications are available online at Barnes and Noble, Amazon, OmniLand Books, and bookstores throughout the world. For a short synopsis, and other information on these books, click Book Catalog. It’s here: a quality cookbook with over 500 high-resolution photographs; over two years in the making. This outstanding collection of illustrated recipes is now ready for your kitchen. To read more click Book Catalog. Getting it right is of the greatest importance to OmniLand Books in a world where mediocrity is the norm. If you think you may be interested, e-mail us with any questions. One more thing, we are working on these pages live. You'll see things that will not make sense, mistakes and typos, but it will eventually get organized. Watch us grow. If you have a manuscript in a drawer or on a shelf and a bunch of form letter rejection slips next to it; you are one of the reasons OmniLand Books came into existence. Many of the supercilious, big-time publishers of today will not look at your creation unless you ask them in a pleading prose, known as a query letter. In addition, most of the biggies require that the query be presented by a Literary Agent; you have to hire an agent before they’ll even let you send your query. If you read this far, you know what I mean, so I’ll move on. 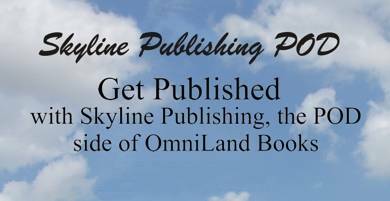 Skyline Publishing, the POD side of OmniLand Books can help you publish your manuscript and turn it into a high-quality soft or hardback book. We can help authors with interior formatting and cover design. Your book becomes available to 25,000 retail outlets and through major internet retailers like Amazon, Barnes and Nobel. And, of course, OmniLand’s online “Book Catalog” will make it easy for your friends to order your book; it’s just a click away. You submit your finished manuscript, to the same address above, and we will work with you to get it in print in a hassle free step-by step process. We do not do it the same way each time because each author has different problem areas and we adjust to their needs. OmniLand Books will assign your book an ISBN number. We will affix the EAN barcode. Self publishing has served as a launching pad for many notable authors; and it is becoming an industry standard for getting published. It allows you, the author complete control over publishing your own book. Self published authors include John Grisham, L. Ron Hubbard, Richard Nixon, Henry David Thoreau, Edgar Allan Poe, Edgar Rice Burroughs, Rudyard Kipling, and who doesn't know about Leaves of Grass by Walt Whitman. This web site most recently updated on Jan. 18, 2008.